Another Forum Hoard is available for free. 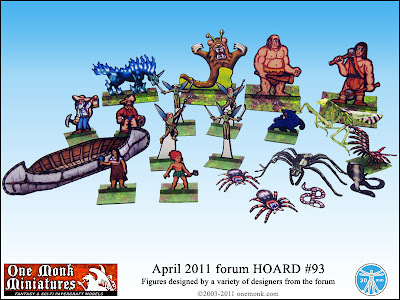 The Forest Creature themed hoard dates its creation back to April. This exciting new set includes some really neat stuff ranging from a birch bark canoe to a grizzly slug. You can't go wrong with grizzly slugs after all. We are still in the process of trying to get the Forum Hoards caught up (it might take a while). And on that note, we are looking for an awesome forum member to step up and help us out with the community created forum hoards. Initially we will work with this individual to get the sets all caught up and current. Once the sets are caught up, we would like someone to take over this job. In exchange for their efforts, we will offer this individual free paper mini sets. Including all sets past and forthcoming, for as long as they help us with the hoard files. If you think this person might be you, then please contact us for more details.